Noise-cancelling headphones are a good choice if you want to listen to music safely in a noisy environment. They cut out the background noise which means you can set your volume to a lower (and safer!) listening level. Most noise-cancelling headphones (whether worn over-the-ear or in-the-ear) use two different methods to reduce the background noise for the user. An electronic process known as ‘active noise control’ is used to to cancel the low-frequency portions of noise, like the hum of an aircraft or traffic noise. The headphones are fitted with a tiny external microphone which picks up the ambient noise in the environment. Electronics within the headphones sense the microphone input, create a ‘fingerprint’ of the noise and then create a new wave that is 180 degrees out of phase with the noise waves. This new wave is sent to the headphones where it is played along with the audio track the listener is trying to enjoy. The newly generated sound wave cancels out or erases the unwanted noise, but does not affect the audio track! To reduce the high-frequency portions of noise, a less technical process called ‘passive noise control’ is used. 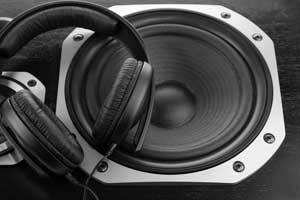 This is essentially a matter of soundproofing whereby the materials of the headphones themselves block out some of the sound waves. Together these two processes ensure that background noise is minimised so you don’t have to crank up the volume to try and drown it out! It’s a win-win for you – your music sounds crisp and clear and your ears aren’t being damaged by excessive volumes!